I am new to the forum as I have just purchased by first Rickenbacker! It's a 2011 360 in Fireglow and I am very impressed so far. I am blown away by the tone from those Hi gain pickups in particular. I have noticed a slight problem however on the finish around the frets. It seems to have lifted a little. Is this a common Ric problem? I have a Tele with a maple neck that has done something similar, but on the side of the neck on the fret ends. Does it affect the playability or sound? No not at all. I just like my guitars to be as A1 as possible when I have paid a lot of money. I have seen a bit of this on my newer 4003, from 2010. Maybe it's something that the newer UV-cured finish is more prone to than the older varnish formulas. But if that's the only issue it has, I say the benefits still far outweigh the costs. A little dust on the bottle does not detract from the wine. Maybe wipe the fretboard with lem-oil. 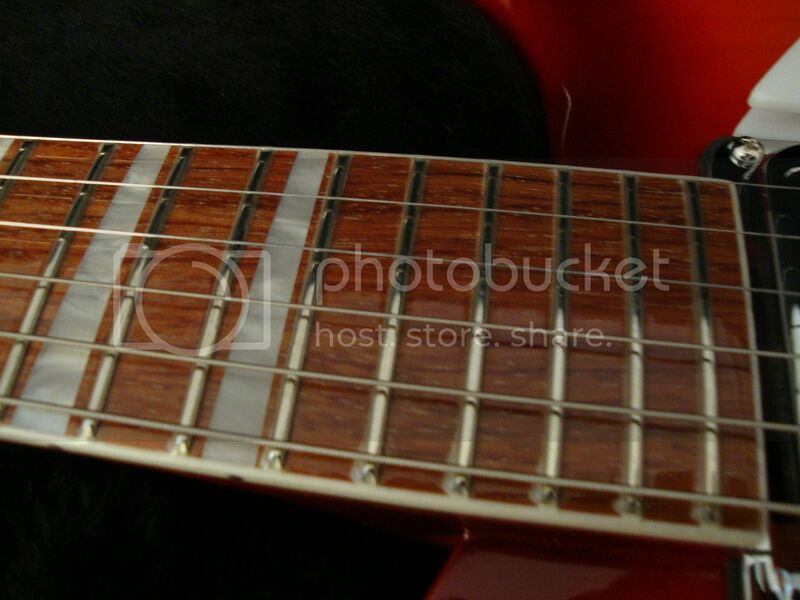 I had a look at the photo but couldn't see the problem, is it directly on either side of the frets? Yep, but if I'm honest, it is fairly minimal. Maybe I am being too fussy. Overall, I am blown away by the guitar in every respect. I have owned Gibsons and Fender for years, but I can now see the attraction to Rickenbacker. I don't know what all the fuss is about the necks.... Its one of the most comfortable necks I have played and the action is incredible. When I first saw these, they actually looked as if they might be pooling of the finish. Were these present when you initially got the guitar? Other than "living with it," no one can suggest a corrective action until we know exactly what it is and exactly what the cause is. Once we know these things, the fix will be evident and probably not too difficult. But I guess this is why you've posted here.... Sorry I couldn't help more. Others will be along in the next few days. (It's the weekend.) Keep checking back. Maybe wipe the fretboard with lem-oil. That only works on unfinished fingerboards. Yes, those are the ones. I appreciate they are quite minor, but they are there nonetheless. If this is common thing with lacquered fretboards, then fine. On closer inspection, it looks like the is a "heap" of lacquer where it meets the side of the fret. Like it hasn't been trimmed away completely.